It was another successful weekend at the year's largest local gathering of movers and shakers. Anderson Building Movers took home TWO awards. Although only one win is allowed across all categories, the committee makes an exception for the "Hard Luck" award. This award goes to a mover who had an exceptionally difficult time with a move or had something out of their control happen, which was the case this year -- we got an emergency call from a customer that flash flooding was causing his newly dug basement walls to give way, so we needed to rush to the site to secure the cribbing the house was balanced upon; only problem was that there were tornadoes sighted nearby at the same time! Thanks to our dedicated crew (who had already gone home for the day), the house was saved and now sits on its new foundation safe and sound. 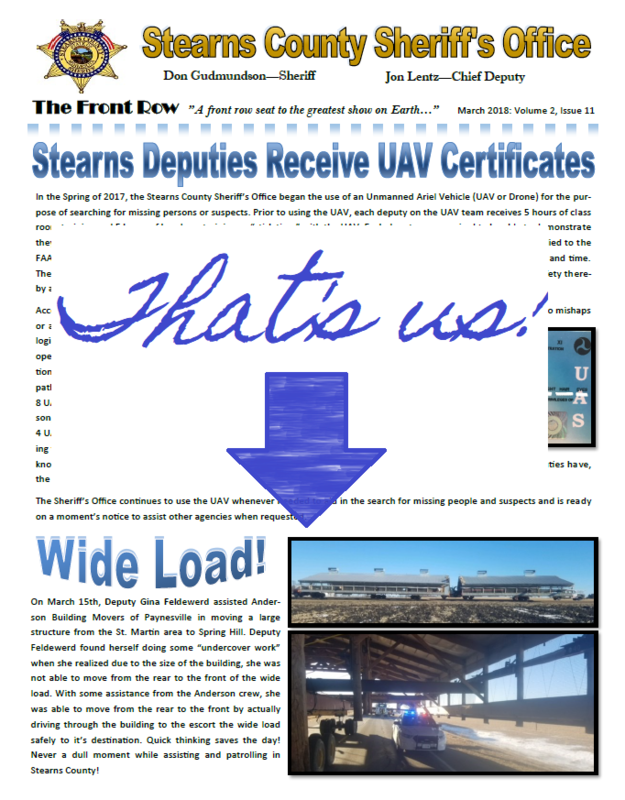 The other award goes for "Longest Structure Moved" for a 126-foot long pole shed we moved last October. Overall, it was an excellent convention with a lot of other great movers from Minnesota and bordering states. The other exciting news that came out of the convention was that our owner, Neil Anderson, was elected to Vice President of the organization! Congrats to him. His hard work and dedication to the industry is recognized by many and we're proud of him. 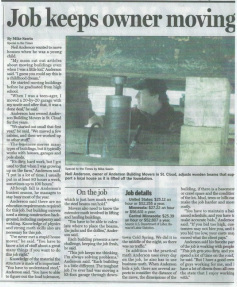 It took a couple of years, but Anderson Building Movers finally made it to national television in America! The first episode aired at 11e/10c on November 13th, with another showing slated for December 18th at the same time. Set your DVR for "Minnesota Mansion"! This was a fun move for an absolutely fantastic family. Award for "Heaviest Structure Moved"
Our third official MHA award. It is only possible to be awarded once across all categories each year. This year, we took home the award for "Heaviest Wooden Structure Moved" although we qualified in other categories as well. This award will be added to our 2012 "Building Moved the Longest Distance on House Moving Equipment" Award and our 2009 "Tallest Structure Moved" Award! Anderson Building Movers is featured on HGTV's "Massive Moves"
During the hot summer of 2012, camera crews followed us around a job site for a week as we loaded and moved a huge farmhouse from the Fargo area 60 miles away. What an honor! Spring 2012, a Japanese film crew accompanied us on a move in west central Minnesota. This was for a game show, and although we're not exactly sure what the goal for the contestants was, they all seemed shocked that such a thing could be accomplished! An Interview with Neil Anderson in "The Land"
Being the outgoing and friendly person that he is, Neil struck up a conversation at the 2011 MN State Fair that led to the other guy, who happened to be a writer for The Land magazine, to write an article on Neil's career. With a cumulative total of over thirty years experience on the crew, Neil has been confidently doing interviews on his career for many years, as this article proves.